You guys, it’s cold. I mean, seriously cold. We may have narrowly escaped the polar vortex but I’m still feeling its aftermath. Most days John and I hunker down inside next to space heaters. 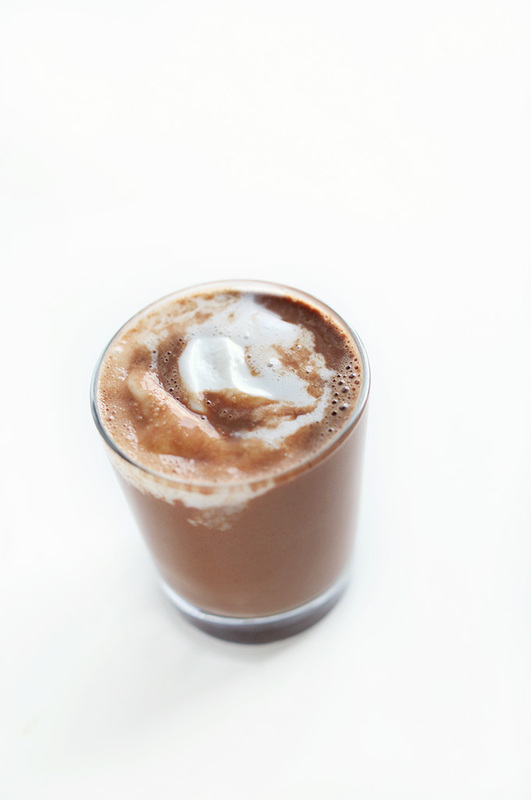 But when I just can’t kick a chill – or am having a serious chocolate craving – I make my favorite 5 minute (or less) vegan hot cocoa. It’s such a simple recipe it’s almost a non-recipe. 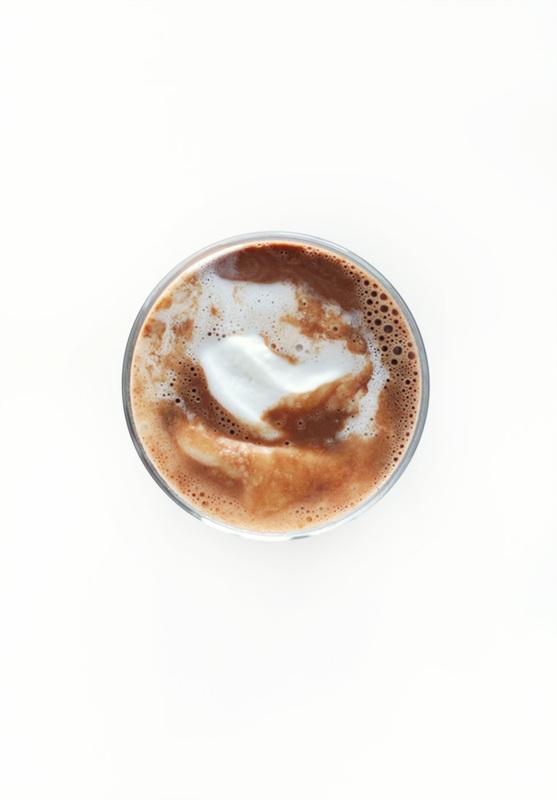 But I asked Facebook fans if they’d be interested and the answer was a resounding ‘yes.’ So, here it is – my go-to homemade hot chocolate that’s way better (and healthier) than any packaged or boxed mix you’ll find. You can make this in the microwave in a big mug – I use my big yellow cereal mug that I’ve had since high school and have carried with me like an adult blankie. Or, if you’re not into the microwave or would rather go old school, simply add ingredients to a small saucepan, bring to a simmer and whisk away. Creamy perfection is just 5 minutes away. Next I like to add a little extract. I know everyone usually recommends adding vanilla to “bring out the flavor of the chocolate” or something like that. But I’ve been on a chocolate peppermint kick for the last few months, so I put in a drop or two of peppermint extract and it sends my tastebuds straight to heaven. The last element? Coconut whipped cream. I mean, hubba hubba. Also, WHY NOT? It really does put the finishing touch on the cocoa and gives it that luscious, creamy effect I just adore. And there you have it! My 5-Minute Vegan Hot Cocoa. I hope you make it a lot this winter to keep warm. And if you do, Instagram me a photo – it’s kind of my favorite. Then we can be warm together via internet. 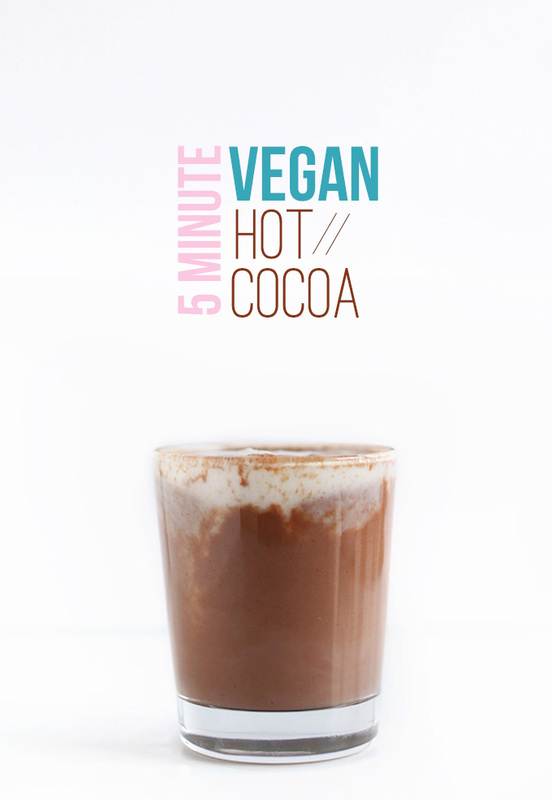 My go-to, 5-minute vegan hot chocolate made with simple ingredients you always have on hand. Creamy, luxurious and surprisingly healthy. Add almond milk to a large mug and microwave for 1 minute. Alternatively, add to a saucepan over medium heat. Once milk is warm, add cocoa powder, chocolate and sweetener and whisk to combine. Put back in microwave or continue cooking on stovetop until completely combined and has reached your preferred temperature. Lastly, add in your extract of choice – I think peppermint is truly unbeatable. Stir, and top with coconut whipped cream. *Nutrition information is a rough estimate for one serving with stevia for sweetener and 1 1/2 Tbsp coconut whipped cream. Can you sweeten with maple syrup and get similar results? Smart! Thanks for sharing, Brittany! I made this recipe tonight with vanilla extract, stirring in a teaspoon of coconut oil instead of coconut whip (didn’t have any on hand) and including a pinch of salt. This is easily my favorite vegan hot cocoa I’ve made so far and with this combination of ingredients, is easily a pantry staple in my house. I’ve worked so hard to find proportions I like that I copied it down in my recipe box. Thanks for another great recipe, Dana. Tasty! I added about 1/2 cup more of almond milk and a good pinch of salt! Thank you! I just made this and I am in heaven! Thank you! 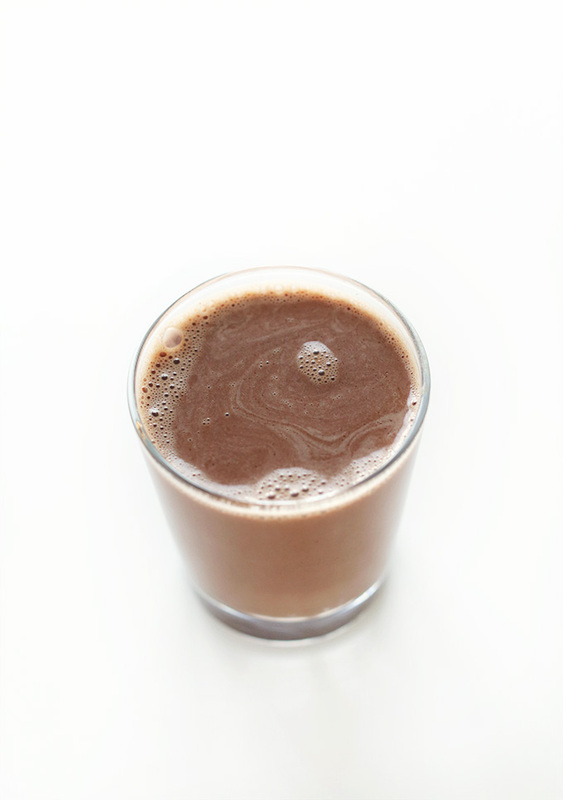 I used oat milk (what I had), Cacao powder (what I had), pascha 100 percent Cacao Chocolate Chips unsweetened, and peppermint extract and NO sweeteners and it is AMAZING! Thank you so much. The best! I just made a big batch for my whole family after a snowperson building marathon and it was loved all around. I subbed canned coconut milk for half the milk since I wanted over the top decadence, exchanged the sugar for an equal amount of maple syrup, and then let my kiddos customize. One chose a bit of orange extract, two went with peppermint, and I went the Mexican route with cinnamon and Chile. All were amazing. Thank you for constantly being my go-to for veganizing all of our family favorites. My husband and I tried your vegan hot cocoa recipe for the first time tonight. We enjoyed it very much and will be making it during this winter season. Since I have a dairy allergy, I thought I would not be able to drink hot cocoa again but you have made it possible. Mind was blown by how good it was. Can I use cashew milk? Yummy! I never thought I could have a hot chocolate this good since I’m lactose intolerant. Thank you! One of my children is vegan and the rest of the family is not, but I am interested in a more plant-based diet. Where do I find chocolate that is dairy free? Can this mix be made up in bulk and then just use milk of choice? Most grocery stores carry vegan chocolate! The best way to make sure chocolate is vegan is to quickly scan the ingredients. Good chocolate should only have a few, so it’ll just take a second. Look out for tricky ingredients like whey or casein, which are milk derived. Hope this helps! I just made this and holy no-cow!!!! It is DELICIOUS! (I added some dairy-free Redi-Whip.) This will be my go-to recipe now. Loved this simple yet delicious hot cocoa. I threw all the ingredients in my vitamix. I added some cinnamon and pinch coarse sea salt. This going to be my new favorite go to for hot cocoa. Thanks for the recipe. 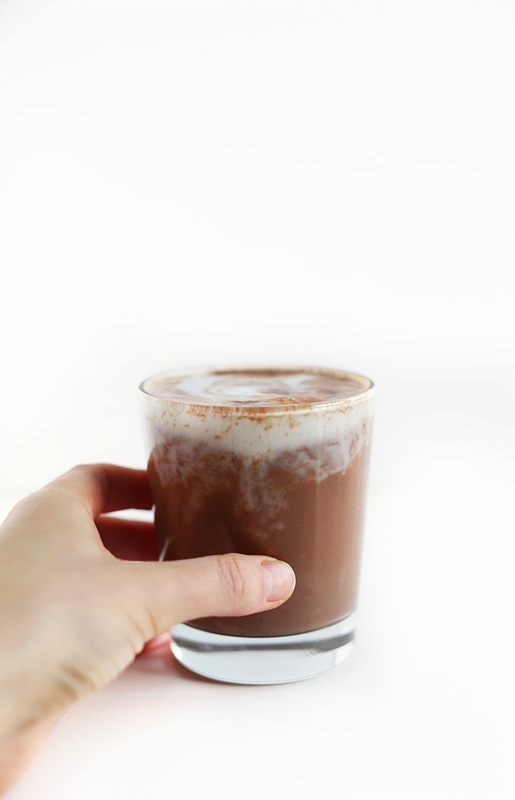 I have made at least two other recipes for vegan hot chocolate before trying this one, and the other two were just a tad bitter, but this one was perfect! I didn’t have any extract but the four main ingredients I had on hand, and it turned out great. I even had some vegan marshmallows so I put those on top. Very delicious, thank you so much for sharing this simple recipe. I think that adding the chocolate bar, not just the cocoa powder, made the difference. I was telling my dad as I was making it that it wasn’t fair to live in a world without hot chocolate, and here I am, living the dream. Thanks again! Simple and awesome recipe. I added a little bit of no flavor coconut oil to this and whisked it. It comes out really creamy! BEST hot chocolate ever! Made mine with homemade almond milk. Best hot cocoa I’ve ever had! Not sure what took me so long to make it!! This is probably a weird question but is there a vegan white hot chocolate recipe? My oldest dislikes chocolate unless it’s Oreos or KitKat’s lol. Hi! We don’t (yet) but I am going to add it to our recipe request list as one to tackle! Thanks Venessia! I loved this recipe! I didn’t have almond milk, so I used soy…it was so delicious! It was rich and creamy and just perfect for a cold winter day. Thank you! I love your site and recipes. I realize this was published a while ago, but the fact that I’m commenting all this time later is a testament to how ridiculous this is. Too. Freaking. Delicious. Thank you!! I went the vanilla route instead of the peppermint route. And then… I added peanut butter powder! So so so good. Peanut butter and chocolate fans NEED that addition! Would this recipe fare well in a crock pot and on a large scale? My daughter just said “can I give you a hug because this is so good? ” then proceeded to give me a hug. So good! It says cocoa powder, would there be much of a difference if I used cocao instead? I’m actually not sure where to get unsweetened cocoa powder. I’ve been following these recipes for years. My uncles daughter is vegan and we have been slowly converting him. This is the first recipe I’ve seen him share on fb abs he said he likes this recipe better than the traditional “hot cocoa” he drinks. So good to hear!! Hi Melissa! Yes you can! i have been eating a plant based diet for a couple years now and have so missed my hot chocolate!! I have tried some other recipes but they were gross but THIS ONE!!!! WOW!! I am smiling and giddy right now as i drink this delicious hot chocolate!!!! thank you!!!!!!!!!!!!!!!!!!!!!!!!! I made this after realizing we have no packets of hot cocoa. Im lactose intolerant but not vegan so I used regular chocolate chips but had almond milk. This is way better than Swiss Miss type stuff and it’s as creamy as it’d be with regular milk. I added a splash of peppermint schnapps to add even more fun to it, and it goes perfectly in this recipe! Thank you so much for sharing this recipe. I recently had to give up dairy and the hardest part was giving up milk. Hot chocolate was something I really enjoyed, especially on a cold day. I tried other recipes, but didn’t like any of them. This recipe is rich and creamy and doesn’t taste like its made with almond milk. I am so excited! I added a tiny bit of vanilla and its perfect. Again, thank you! This type of recipe make tough diet changes much easier!! Wow this was really delicious!!! I googled a recipe at my daughters request for a hot chocolate with almond milk. I was really impressed, I did not miss the milk at all. It’s actually one of the best cups of hot cocoa I’ve ever had. I just took a little bit out of my daughters cup — it was so rich and delicious I was satisfied with that. I loved it as- is but My 17 year old daughter found it a little too chocolatey and added 1/4 to 1/3 cup more almond milk. I really should comment more often, because I love you blog! But I made this in about 5 mins, and added a candy cane left over from the holidays for peppermint hot chocolate. This is absolutely delicious! Wow! So much better than I anticipated!! This recipe is a keeper! Such a good recipe; I’m so glad you posted this! I made my own version, using 3/4 cup almond-coconut milk + 1/4 of vanilla bean-infused almond milk creamer, and 1 T of coconut sugar for sweetening. The drink is delicious on its own, as well as with a shot of espresso added in. I want to try making the recipe next with the peppermint extract as suggested. Thanks! Is there a recipe on how to make this in bulk for gift-giving? I’m in the last-minute “argh!” phase and I would love to give this hot cocoa mix as gifts AND do “secretly” healthy for those who pish posh the urgency in our taking care of our bodies by not putting in chemicals, etc. Also, is there such a thing as dry almond or soy or hemp milk? I have seen other recipes calling for dry milk. Thank you ever so much! Unfortunately I don’t think so! I’ve looked for those myself. But you could just gift it with shelf-stable dairy-free milk! I bought mine in bulk at a Bulk Barn store. Can I use raw cacao powder instead of cocoa? Nm….I just asked the same thing before I saw this! I made this today for my kids after they came in from being out in the snow. I had some, too, of course! It was really good! We give it 20 stars (5 stars from the 4 of us). ? ☕ I’ll definitely be making this again!! Can I make this using flax or hemp milk?? …almond allergies…. ? Used this amazing recipe for a hot-cocoa sale today at my dental school :) one girl told me, “this is better than Starbucks!” It was delicious and everyone loved it. Thanks, Dana! 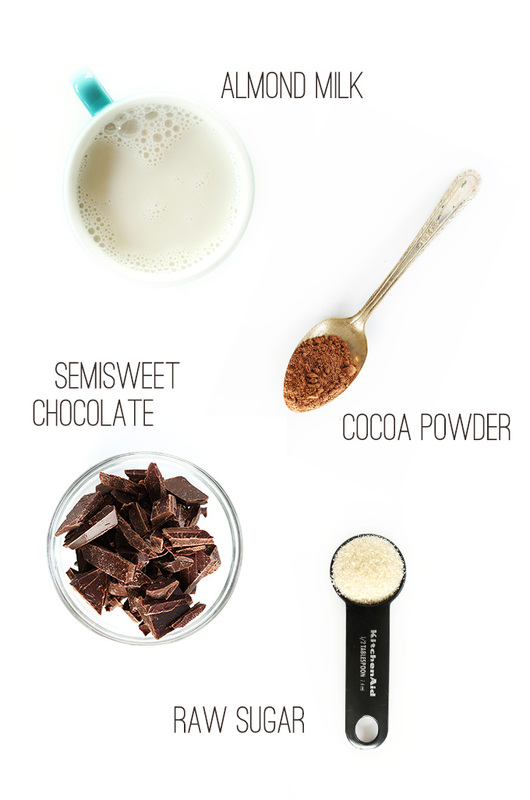 This is the easiest quickest most delicious hot chocolate!! I am a hot chocoholic and now I can make it anytime I want! Thank you!!! My husband and I are trying to transition from vegetarian to vegan. All afternoon, I was craving hot chocolate from the local donut shop, but I have no clue what is in it. 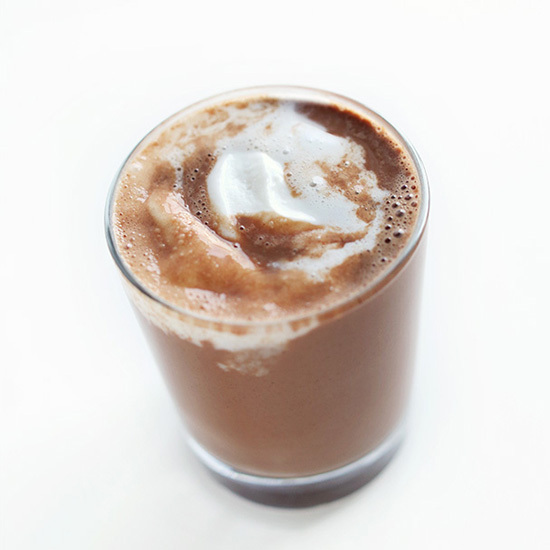 This was the first recipe that came up when I googled “vegan hot chocolate.” I have yet to try a recipe from this website (and the cookbook) that I don’t like. This is yet another winner! I just added a pinch of salt because the hot chocolate I am used to has a bit of a salty kick to it. I made this without having to run to the store for any ingredients! It was so rich and delicious. I am lactose intolerant but I’m not vegetarian, yet I try to eat healthier. Your blog is also really helpful for me since I have a number of friends who are vegetarian or vegan and gluten free. Thanks for the recipe! I am lactose intolerant and was wondering, that even though this delicouse resipe has no milk at all, dose the coco will still have milk in it? By the way i love your post! They look deliciouse and i cant wait to try this out! Thanks! Nope! This is dairy free. I a so happy I found you site. I love the simplicity of these recipes. Thank you so much and keep up the good work. I know I will love this hot chocolate. I truly enjoy your site, my husband and I have just transitioned to vegan/vegetarian for health reasons. Finding good recipes for old time favorites is the toughest part. This looks wonderful. I have always like orange hint in my hot chocolate, any recommendation how to incorporate that? Let me tell you, this hot chocolate is soooooo good! Something about good ol traditional gets me every time! I’m currently pregnant and I almost broke down in the store and cried because out of 20 different hot chocolates, not a single one of them were vegan! They all had milk! I quickly googled this recipe and found the simple items right there in the store in less than 5 minutes. I used Almond lite vanilla milk (which is semi sweet) and light agave nectar for my sweetener. Unfortunately the store was out of vegan whipped cream but to be honest this recipe doesn’t need it! It’s that dang good! Thank you for sharing? This was delicious! I made this for the first time during my semester finals and it was amazing. I have been drinking this as a treat through the winter, sometimes I add coconut extract for an Almond Joy kind of taste. Thank you for all of the scrumptious recipes! Thanks for this! I had been looking for a vegan hot chocolate. It was really good! I did use less sugar, but that was because the only almond milk I had wasn’t sugarless. :) It was perfect because it was ingredients that I already had at home, and I was snowed in. After growing into a pesky dairy allergy at 27 I’ve missed a good hot chocolate. This is super easy and delicious! I added a dash of vanilla extract to mine. Thank you for the recipe!! Amazing and so simple! I added a shot of espresso to make it a mocha. I’m officially hooked. I love this recipe! I usually add a little blackstrap molasses to mine for a boost of iron and calcium. It also gives it a nice tangy dimension. My family has recently discovered we need to be gluten and lactose free! This has been a sudden difficult adjustment for our family. However, with easy YUMMIE recipes like this, all will be well!! Best hot cocoa recipe I have ever used!!! So good! We can’t do almond milk…would soy or coconut work as the best substitute? Thank you! Oh my…I’m thinking this plus a shot of espresso! It may be summer now but I’m looking forward to the chill just to make this recipe. Smart lady! Hope you love it, Kat! I double the recipe using whole milk and an extra T raw sugar. It’s awesome! Thank you! Adding to the home recipe collection. Wonderful! Glad you liked it, Stephanie! Delicious made this last night before bed to warm up. I used rice milk but still thoroughly enjoyed it. Thanks. Yesterday I made a small batch of almond milk using almonds I had soaked overnight. When I was done whirring it in my Vitamix, it was HOT. So, I thought, hmmm, why not just make this into hot chocolate??? So, I reached for some cocoa powder, Truvia, a dash of vanilla extract, tossed it into the hot almond milk in the Vitamix, “zhuzzed” it for a while, making it even hotter (I think), and then poured it into a mug. It looked fabulous but alas, it wasn’t the *best* because it was lacking the chocolate-y ness that the addition of chocolate (as you indicate here!) would bring, but it was a really fun way to make it. I felt like I had just, like, I dunno, discovered America. This weekend, I’m going to get some fun extract and chocolate and try it again — and will post it to Instagram! Thank you for this simple recipe! Great post! I have a quick question. Does your almond milk get a ‘curdle-like’ consistency when heating it in the microwave? The hot chocolate tastes fine, but I see little clumps floating at the top. This is so good! I haven’t made this on the stove yet, but it comes out perfect in the microwave. I’ll be drinking this all winter! So glad I found this! It is getting me through finals. Thank you so much! I had everything and it is perfect- takes enough time to be a study break and makes even the toughest subject bearable. I will also be using this when my roommates (non vegan) and I (vegan) have our holiday movie binge! Can’t wait to explore your blog more. Great, thanks for sharing, Lauren! This is absolutely delicious! My husband, kids all love this. This is perfect on cool fall and winter nights. I make it on the stove top whisking it all together and it is fantastic. Thank you so much for publishing!!! LOVE IT. Drinking this as we speak! Did a Google search, ran across yours and made it…fantastic!! Don’t forget the coconut whipped cream on top! Thanks so much–I love your blog! Hmm, I’d just multiply the dry ingredients by however many you have room for (maybe 10x?) and then add to your warm wet ingredients to taste! Thank you for the awesome, simple, delicious recipe! I never tried making it on my own, nor had I bought any since going vegan almost two years ago. So simple, I had all the ingredients and whipped it right up….delicious!! Great! Thanks for sharing, Kenzie! I just tried your recipe and is the best. I used vanilla extract but I can’t wait to try it with peppermint extract. Thank you Danna for this great and easy way to make my favorite winter treat… YUM!!! auto-correct errors, you understand I hope! Thanks for sharing doll! Trying tonight! Curious, what do you use to get a white background with your images? Thank you! such a speedy response and I appreciate it :) I’ve always been curious! I used to have a beauty blog WAY back. I absolutely love your blog and will be a frequent visitor for recipes/ideas! I have been eating vegan now for a few months. Sending love & light your way, best wishes! I drink cocoa all year round because I love the flavor and health benefit. I make a simpler version. Just boil water in a tea kettle (I don’t like to use a microwave), add organic dark cocoa and organic stevia, and chug it down. If I want to splurge, I add a shake of cinnamon on top. Just about to make this with coconut milk – because it’s summer and i’m feeling tropical. PS. Your blog is delicious – my latest obsession. Lovely! Thanks for sharing hello! Hope you enjoyed the drink! My daughter (3 yrs old) was watching Frozen the other night and started begging for Hot Cocoa, which I did not have, then I remembered seeing this on your site! She loved it and insisted that daddy have a cup when he got home from work! Thank you! Yay! So glad I could help in a hot cocoa pinch. Cheers! This sounds absolutely delicious, I might have to give it a try tonight! YUM! This looks delicious and beautiful! It’s snowing again here today, I almost cried!! …buuuuuut now I have this awesome recipe to look forward too!! I bet a pinch of cayenne would be delish in this too!! I have to try that coconut whipped cream too!!! I’m definitely making this tonight after coming home from walking the pooch in this crazy snow storm. How many calories is it with out the whipped cream? Yum, Yum, Yum! I love the sounds of this – especially with a hint of peppermint! Gotta love simple stuff like this! so much goodness! Considering it is minus one billion outside right now, this is totally happening later today. I even have all of the ingredients on hand. Can’t wait! A little almond extract instead of the peppermint and you’ve got yourself an Almond Joy in a mug. Candy bar in a liquid form? Uh, yes please. My philosophy exactly. I need to try mine with cacao powder – it’s just so darn pricey! Hot chocolate and space heaters are really the only sane answer. Homemade hot chocolate is the best because it actually tastes like chocolate. Instead of sugar. Great way to warm up on a chilly day! I love the simplicity. This definitely deserves a HUBBA HUBBA! haha, thanks! I like vegan and vegetarian meals alike. Glad you understand me! This recipe looks delish along with the rest of your website :D I was wondering if it would be okay to make this with soy milk? Thanks!! Can I ude home made oatmilk in sted of almondmilk ? We don’t recommend using homemade oat milk as upon heating up it will thicken and become gelatinous in texture. Perhaps another nut milk, Angelina?